Whilst many people were enjoying a relaxing Saturday morning, four members of the Team Bath Rugby squad and two MJ Church Foundation Auction winners, were getting ready for a big machine experience. Digger Driving is part of everyday business at MJ Church, but as events such as the Tractor Ted Diggers and Dumpers Weekend have shown, it’s an experience on many people’s bucket list. As part of the relationship MJ Church has with Team Bath, players were invited to have a go, along with Jon and Ian who bid and won the experience as part of a charitable donation from the Foundation. 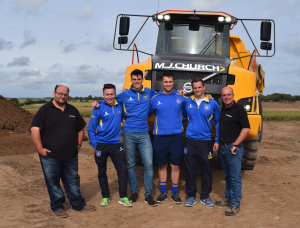 Tutored by Steve Hargreaves and Chris Purton from MJ Church, the would-be drivers were put through their paces loading a 30ton Volvo dump truck with a 14ton excavator. There was definitely a driver of the day – but we are keeping quiet about that as everyone had a fantastic morning!